Most GPS systems have difficulty finding our schools, so we offer this page to help people from out of town to find us. BASIC - Keep it simple, please. STEP 1. Get to Lucerne Valley – Interstate 15 in the High Desert region is key to reaching Lucerne Valley, which is 20 miles east of the freeway past Victorville and Apple Valley. You can exit on one of two offramps: Bear Valley Blvd. or on Highway 18/D Street, both exits in Victorville. Either way, head east. Lucerne Valley Elementary School: Continue on Highway 18 and turn left on Highway 247 at the four-way stop in the center of town. When you pass the Power Sub-Station, the Elementary School will be on your left hand side. Lucerne Valley Middle/High School: Before entering Lucerne Valley on Highway 18, turn left on Rabbit Springs Road. At Kendall Road, turn left, then immediately right to continue on with Rabbit Springs Road. Go past Highway 247 and the Middle/High School will be on your right side. LVUSD District Office/Alternative Education Center: On Highway 18, when you see the Gas Stations, follow Highway 18 leading to Big Bear when it curves to the right. Continue following it until you reach a small mountain on the right. Pass Meridian Road, continue for two miles, and turn right on the next paved street (there isn’t a sign for Aliento Road). The District Office/Alternative Education Center is perched on the northeast side of the small mountain. ADVANCED - I never use GPS. Bring it on! Clicking on a title below will show a Google Map of the largest part of the trip. Each set of directions will have separate instructions to reach the Middle/High School (LVHS), Elementary School (LVES), or the District Office/Alternative Education Center (District Office). If you need more information or directions based on your current location, contact our District Office at (760) 248-6108. If you’re on CA-58, follow I-15 north at the end of the freeway. If you’re on I-15 north of Barstow, head south. Exit on “Barstow Rd./SR-247”, then head South (towards Barstow College) for 25 miles (steep grade at 4000 feet). LVHS: Turn left on Rabbit Springs Road, we’re on the right hand side. LVES: Pass Rabbit Springs Road, we’re on the right hand side before the Stop sign. District Office: Pass Rabbit Springs Road, then go straight after the Stop sign. Turn left on SR-18 towards Big Bear. We’re at Aliento Road (street is unsigned) or the next right turn after Meridian Road (turn right, follow the pavement). If you see Midway Road on your left, you passed it. Proceed South on Interstate 15, exit on Stoddard Wells (the first exit, next to the Burrtec Disposal Facility). From there, turn left on Stoddard Wells Rd. to go under the freeway, then right again to head south on Outer Highway 15. Turn left on Falchion Road, then turn right on Apple Valley Road. Turn left on SR-18 and drive for 11 miles completely through Apple Valley. 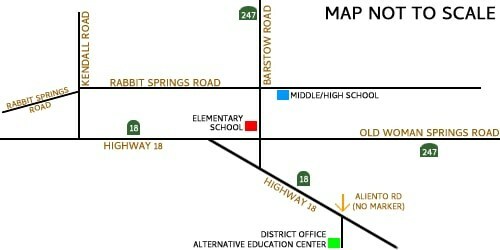 LVHS: Turn left on Rabbit Springs Road, pass Barstow Road/SR-247. We’re on the right hand side. LVES: Turn left on Rabbit Springs Road, turn right on Barstow Road/SR-247. We’re on the right hand side. District Office: Pass Rabbit Springs Road. Continue through town and follow the signs to head to Big Bear (SR-18 turns right after the Gas Station). We’re at Aliento Road (street is unsigned) or the next right turn after Meridian Road turn right, follow the pavement). If you see Midway Road on your left, you passed it. 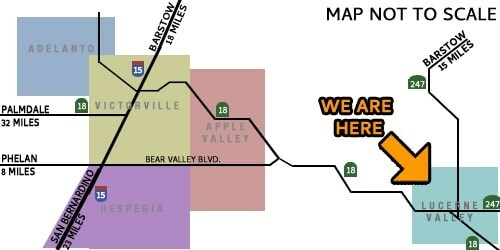 Follow SR-18 east through Apple Valley and past Bear Valley Road for 7 miles. Ongoing Construction on the I-15/I-215 Interchange will take place now through the second half of 2016. Updates are available weekly on the Devore Interchange Project site and the Cajon Pass Project site. Unless a detour route is established by CalTrans, it is strongly recommended NOT to take another route using Hwys. 138, 18, or 330 during Fall/Winter months due to closures. Cajon Pass also infrequently closes during Winter from snowfall/ice conditions. Head north on I-15 from Devore up the Cajon Summit (uphill – steep grade at 2500 ft.) for 21 miles. In Victorville, exit on Bear Valley Road, then turn right (head East). Continue through Apple Valley, all the way to the end of the road. Merge right at the curve to head East on SR-18 for 6 miles. District Office: Pass Rabbit Springs Road. Continue through town and follow the signs to head to Big Bear (SR 18 turns right after the Gas Station). We’re at Aliento Road (street is unsigned) or the next right turn after Meridian Road turn right, follow the pavement). If you see Midway Road on your left, you passed it. ROUTE NOT ADVISED FOR BUS TRAFFIC/NOT AN APPROVED TRUCK ROUTE: Head north on I-15 from Devore up the Cajon Summit (uphill – steep grade at 2500 ft.) for 21 miles. In Hesperia, exit Ranchero Road, turn right. Take Ranchero Road all the way to the end and turn left on Arrowhead Lake Road. Turn Right at the traffic light into Deep Creek Road, then left on Kiowa Road. Turn right on Bear Valley Blvd., and continue through Apple Valley, all the way to the end of the road. Merge right at the curve to head East on SR-18 for 6 miles. From I-10, exit on SR-62 and head North up the Morongo Canyon (steep grade at 1200 feet). When in Yucca Valley, turn left on SR 247/Old Woman Springs Road. Proceed for 42 miles. LVHS: Turn right on Camp Rock Road, then left on Rabbit Springs Road. We’re on the left side. LVES: Continue past Camp Rock Road, then turn right on Barstow Road (follow SR-247). We’re on the left side. District Office: Turn left on Camp Rock Road, then at the end of Camp Rock, turn right on SR-18. Shortly after passing Midway Road, turn on Aliento Road before SR-18 goes up a hill (turn left, follow the pavement.) If you see Meridian Road on your left, you passed it.